2. Go to And The Dish Ran Away With The Spoon | One year, one job. I’ve been following And The Dish Ran Away With The Spoon (Hence: ATDRAWTS) on Facebook and Twitter for a while. Every time they’ve posted a photo of their cake cabinet, my stomach screams out yelps of excitement that even my freshly baked burger cakes can’t quell. And so yesterday, I finally jumped on the 143 and headed off to see how the other half live in the 99% student-free suburbia of West Didsbury. I’ve only been to West Didsbury once before, when I was writing a feature on the parking permit debacle on Burton Road (here for those desperately keen on reliving the news of 2010). I’d been coveting the row of foodie destinations and promised myself I’d be back to try some out for myself. Two years later and my return was long overdue. With the social media lure of ATDRAWTS, it was decided that it would be the perfect destination for a mild February Saturday afternoon jaunt. Between the three of us we enjoyed a Caramel and pecan swirl, Rose glitter cake and a Salted caramel chocolate brownie. They were delicious. All of them. I’d been fortunate enough to try the Rum and Raisin brownies from ATDRAWTS’ side project, The Brownie Post, over Christmas and had been chuffed with them despite my dislike of rum which tells you something about the quality of things here. 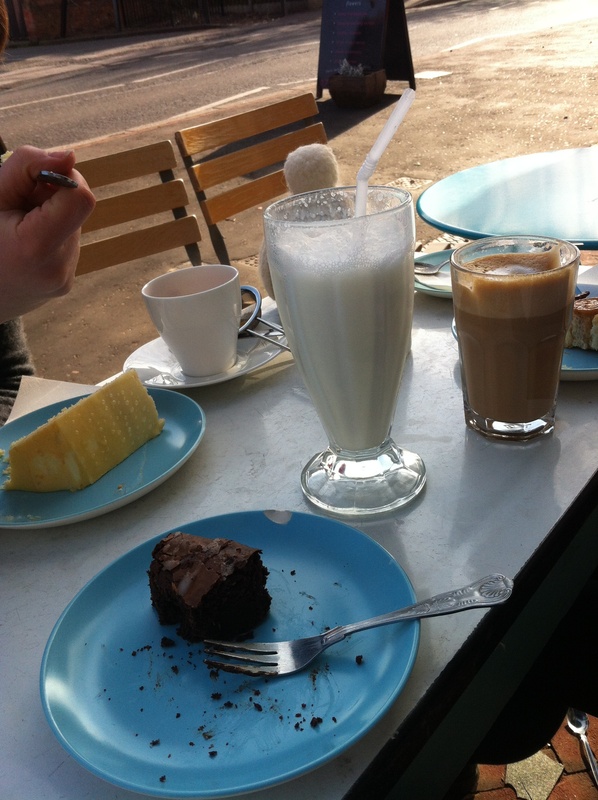 Prices weren’t too bad either – a milkshake cost £3.50 (the going rate at Home Sweet Home and TROF) and my brownie was £2. Oh, and the cake slice was huge. To be fair, it was described as a ‘lovers cake’ but Lucy beasted her way through it with just the one fork. We walked along Burton Road towards Withington and back to Fallowfield and I quickly realised how much you can discover by venturing out to neighbouring suburbs. Burton Road had some of the cutest interiors shops I’ve been in for a while and a lovely clothes shop which, with 20% off sale goods, had some very fairly priced jeans which I sadly couldn’t quite squeeze myself into. Oh, and the Salted Caramel at Cocoa Cabana was cheaper than the ones from Bon Bon Chocolate Boutique in the NQ and I couldn’t see any discernible difference.